Is a Facebook friend the same as a real-life friend? It depends. This advice is for those who want to have meaningful connections on Facebook. 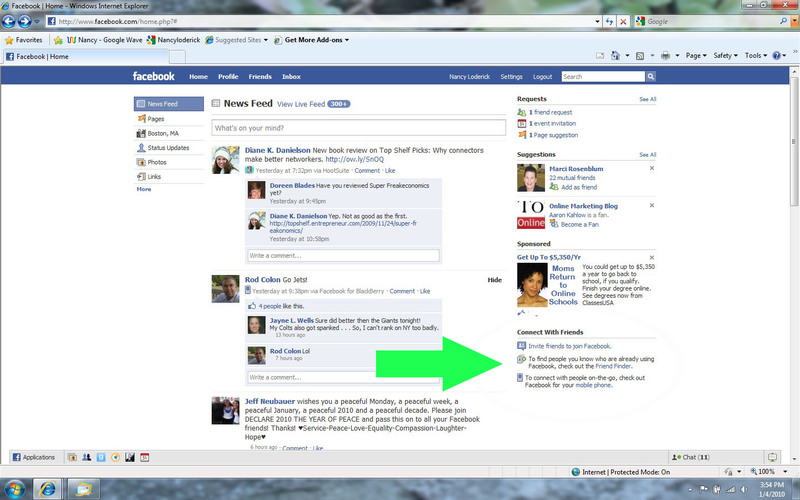 On your Facebook Home Page, in the lower right corner are the links you’ll need (see big green arrow). Click on the image below and make a full-screen view and you’ll see what I mean. 2. Invite people from your email address book. 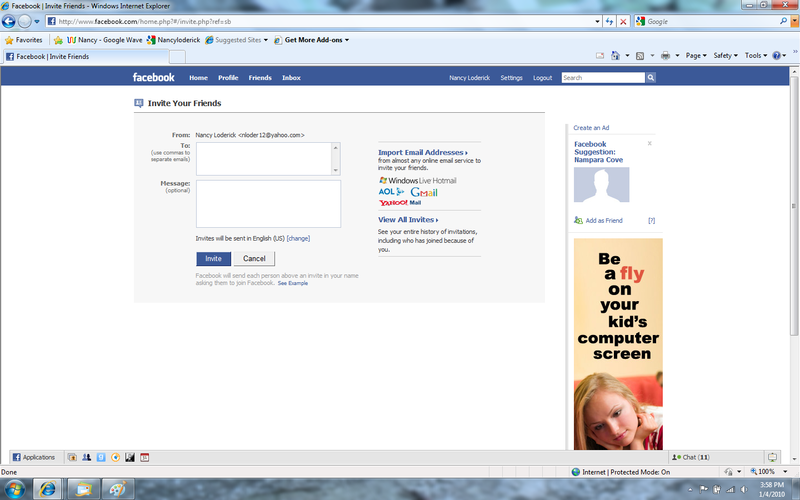 On the Home page, click on the link, “Invite friends,” and you’ll be brought to the page below. Click on this image and make it full screen to see what it will look like. **Be sure to put a personal message; you’ll be more likely to get a response! **Don’t do a mass invite of everyone in your address book. Do you really want to be Facebook friends with your boss? 3. Invite friends of your Facebook friends. Chances are you’ll know some of the friends of your friends. 4. Check out the Suggestions on your home page. Although it’s a mystery how Facebook decides who to include in this section, you might find some interesting people there. If you are going to invite people you don’t know, always include a personal message explaining why you’d like to connect with them. Do you have a mutual friend? Do you have mutual interests? Are you both part of a Faceook group? 6. Think before accepting Facebook friend invites from strangers. Take a look at their profiles and if you like what you see, accept their invitation. single guys who are looking for women. Yes, I still get a lot of these. They must have a thing for blondes. people who are obviously collecting names so they can market to you, e.g. Amway or Shaklee distributors. Not everyone has the same notion of Facebook etiquette. Even people you thought you knew well may turn out to be annoying on Facebook. They may constantly share their political views or their pet causes. You can either hide their updates (just click on the “hide” button next to their name. Or, if they are just too annoying, you can unfriend them. Just go to your Friends list and click on the “X” next to their name. They won’t be notified if you do this. Great post, nice summation of how to think about this topic. @eric – thanks for your comment. In my next post, I’m going to tackle Facebook Privacy Settings. It will be quite a challenge to explain these, since they seem to keep changing! Happy New Year! I found this blog intersting. Your recommendations are how I have been using Face Book and I found your comments reassuring because I have been questioning my use of Face Book given that I am looking for a job. I want to continue to use it because some of my and all of Dave’s family is out of state. I love the “hide” button. I look forward to reading your follow up Blog on Privacy settings. I’m glad that you find my blog interesting. The way people are using Facebook is evolving and it is becoming so much more than a social application between friends. Recruiters will google applicants and carefully look at how they’ve presented themselves on Facebook, LinkedIn, MySpace etc. Have you periodically googled yourself to see how you’re portrayed online? A simple rule of thumb is if you don’t want everyone to know what you’re up to, then don’t post it online. Nice post Nancy, I think since Twitter hit the scene, Facebook’s users have got increasingly more private. You’re right about choosing what you use Facebook for… If you have a business, I personally think ‘becoming a fan’ is the solution rather than a ‘friend request’. @Max – thanks for your comment. I agree that having a Facebook Fan page is a better solution than being a friend, or even better than having a group for your your business. As a matter of fact, my next blog post will be about Facebook Fan pages vs. Facebook Groups. @Novella – thanks so much for your comment. I’m glad you like my examples.